We are snowed in at Brian Head, Utah. We had approximately 3 feet of snow yesterday. When we got up this morning, it looked like it might be a good day to ski - the sun was out and the temperature was 15 degrees above zero with winds about 25 mph. We got ready and headed out but the sun soon went behind some clouds and the winds picked up making it just too cold to continue. We returned to the condo for soup and sandwiches after 3 runs down the snow covered slopes. It appears that the storm will continue through the weekend, so there will be lots of cocoa and very little skiing. If there is a break in the weather there may be a torchlight parade down Giant Steps ski run followed by a fireworks display to usher in the new year. 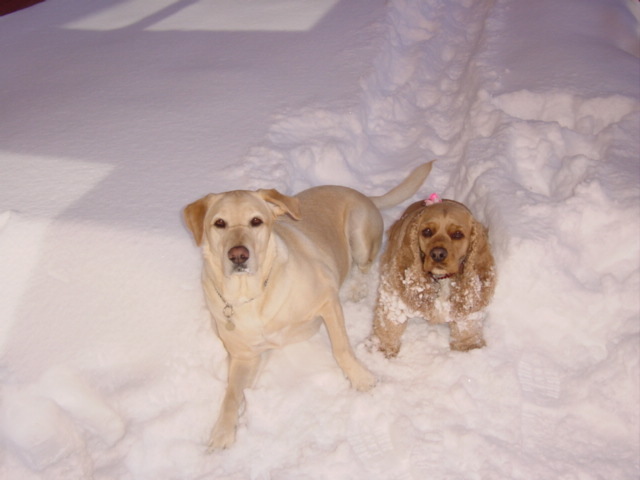 If it continues to snow, we will only venture out to play with our dogs who have a great time romping in the snow. I'm sending everyone a picture of our snow angels just before Cassie decided she was too cold and headed in. Maggie, the red-headed cocker spaniel, doesn't seem to mind the cold at all and looked like a pupsicle before I had to literally pick her up and carry her inside, where my lovely wife spent a half hour brushing the snowballs out of her coat and blow-drying her. I seem to be in a musical mood this week, so I'm going to recommend a song everyone has heard before, Stardust. Today I'm going to suggest you listen to the version played by the great trumpeter, Clifford Brown. Clifford Brown died at the age of 25 in a car accident, but left a substantial body of work especially for someone as young as he was. Jazz was really his love, but he did make a more mainstream album called With Strings, which contains a number of beautiful renditions including Stardust. You can find Clifford Brown's music in the jazz section of most large music stores, or you click on either the amazon.com or cdUuniverse.com logos on the right side of this page and go to Clifford Brown. A very affordable album with some truly great music. Enjoy. Specialist Robert Loria of Middletown, NY, recently lost his arm during the fighting in Iraq. The Army subsequently billed him $310 for missing equipment; over $2400 that the Army mistakenly overpaid him for family separation pay he received while recuperating at Walter Reed Army Medical Center; and over $2200 for travel expenses between Walter Reed and his station at Fort Hood, TX, that should have been paid to him but the paperwork apparently went to the wrong desk. Without enough gas money to get back home, it took help from Senators Charles Schumer and Hillary Clinton to get him back home to NY. This is sad because of the obvious screw-ups by the Army, but the really sad thing is that it took liberal Senators Schumer and Clinton to get the ball rolling in the right direction here. No wonder there are rumblings about the performance of the Secretary of Defense. I understand mistakes are made, but this guy lost his arm....he deserves a lot more than a bill for a few dollars. Specialist Loria should give the Army a bill for his missing arm. You can read more about it in a story by Dianna Cahn (Times Herald-Record dcahn@th-record.com) at LibertyPost.org. Be sure to use the phone numbers in the article to call in your concerns to the Secretary of Defense, etc. The Army has apparently agreed to forgive the $310 for missing equipment, the $2400 for the overpaid family separation pay and will help with re-filing the missing paperwork. Give the Army a gold star....the point, however, is that this should not happen to anyone who has served his country and given so much. It is doubly embarassing that it took Schumer and Clinton interceding to fix things. Chances are you have never heard the song I am going to tell you about or the musician who was featured on the performance. Conrad Gozzo, one of the greatest trumpeters of all time but not very well known outside the recording studio, is featured on the song Trumpeter's Prayer which can be found on the CD Tutti's Trumpets & Trombones. The CD is somewhat expensive but you will not be sorry you purchased it. The one song is worth the price of admission. Composer Tutti Camarata was the director of the Disney Orchestra and when Mr. Gozzo finished playing the aforementioned song with them, the orchestra gave him a standing ovation. The Man With A "Plan"
Secretary of Defense Donald Rumsfeld is, and has been, under fire because of the way he has waged the war in Iraq by the left and even a few people on the right. Of course his critics have all been brilliant military strategists in their own right. The most vocal critic of note was John L. F. Kerry who got his military education at the revered Yale Military Institute and subsequently rose through the ranks to become one of the most famous lieutenants in American history with a command of nearly 20 people under him. During the recent elections Kerry said over and over and over and over... that he had a plan to help us win the war in Iraq. Since Rumsfeld and the inept military minds at the Pentagon are having such a tough time coming up with a 'plan' of their own to win the war as fast as his critics would like, I suggest that ex-Lieutenant Kerry offer his services and his 'plan' (gratis to be sure since Kerry is already on the payroll of the United States as Senator from Massachusetts) to the Secretary of Defense. I am sure with Kerry's 'plan' we can win the war in the next week or two with no further casualties and bring our boys back home victorious. Do Christians Have The Courage? In Mustang, OK, an $11 million bond issue was recently defeated, in part, because of school superintendent Karl Springer's decision to remove a Nativity scene from an elementary school performance while permitting symbols of Hanukkah and Kwanzaa. Apparently the separation of church and state applies only to the heathen Christian religion. While activist judges can legislate from the bench, Christians and others of faith can legislate from the ballot box. We can vote out the bums that appoint these liberal judges and hire the activist school superintendents. We can send our children to private schools and refuse to pay for social programs until some reason returns to our society. Just say NO! The question remains: Are we going to be led as lambs to slaughter or are we going to to fight for our rights? On a recent appearance on Fox & Friends guest Barbara Corcoran when asked about George Bush's plan to privatize a portion of Social Security said, "The average person is not comfortable investing their own money." I missed posting for a few days because my lovely wife had me working like a dog getting ready for an open house we hosted for 75 (+/-) of our closest and dearest friends and co-workers. I dutifully helped with the cleanup too. We had a little of everything at the party: there was lots of food and drink, karaoke Christmas carols, piano playing, foosball games, and even a little Irish dancing. We thought the event was a big success. We hope that those who attended felt the same way. At an event sponsored by People For The American Way at the Kennedy Center Tuesday night, the host Chevy Chase hurt his back while spewing tasteless remarks regarding newly re-elected President Bush. I don’t know if Chevy’s backache was a message from God, but I do know that it is becoming more and more apparent that the Hollywood liberals still don’t get it. After the uproar ensuing the Whoopi Goldberg, et al, Hollywood liberal debacle during the election, one might imagine that there would be an attempt to curtail inappropriate remarks of this type. Americans sent a message November 2nd. Another message needs to be sent to the perpetrators and their supporters of remarks such as these. People with respect for this country, the office of the President, and the electoral process that has made us the world's greatest country need not engage in language that denigrates all three. Most people would not allow an employee of theirs to say these things to their customers. Most customers wouldn’t allow these things to be said to them. We are the employers and the customers of these celebrities and we can show our disdain for behavior of this type by walking; walking away from the movies and the television programs, and of course the sponsors of same, who hire the miscreants who behave this way. Let the liberals support Whoopi and Chevy, but the national map is running red with conservative values. I urge anyone who gives a twit about of the United States to show their support for it by boycotting Chevy, Whoopi, Michael Moore, Barbra Streisand and anyone else who can’t show at least a modicum of respect for the voice of the people. You can read the story by Richard Leiby in the Washington Post. A very good friend sent the following poem to me. It is obviously a revision of the original poem: 'Twas The Night Before Christmas (or Account Of A Visit From St. Nicholas). Until recently it was believed that the original poem was written in 1822 for Clement Clarke Moore's two daughters, Margaret and Charity, and later anonymously published in the Troy [New York] Sentinel on December 23, 1823. But, according to the University of Toronto English Library, in 2000, Don Foster, in his book Author Unknown: On the Trail of Anonymous (New York: Henry Holt, 2000), was able to demonstrate that Moore could not have been the author. Foster concluded that it was probably written by Major Henry Livingston, Jr. For more interesting facts about the original poem see The Donner Party's Over. I have no way of crediting or verifying the author of this revision but it is quite good...please enjoy. ’TWAS THE NIGHT BEFORE CHRISTMAS, HE LIVED ALL ALONE, IN A ONE BEDROOM HOUSE MADE OF PLASTER AND STONE. WAS THIS THE HERO OF WHOM I'D JUST READ? CURLED UP ON A PONCHO, THE FLOOR FOR A BED? I REALIZED THE FAMILIES THAT I SAW THIS NIGHT, OWED THEIR LIVES TO THESE SOLDIERS WHO WERE WILLING TO FIGHT. I KEPT WATCH FOR HOURS, SO SILENT AND STILL AND WE BOTH SHIVERED FROM THE COLD NIGHT'S CHILL. THEN THE SOLDIER ROLLED OVER, WITH A VOICE SOFT AND PURE, WHISPERED, "CARRY ON SANTA, IT'S CHRISTMAS DAY, ALL IS SECURE." PLEASE. Would you do me the kind favor of sending this to as many people as you can? Christmas will be coming soon and some credit is due our U.S. service men and women for allowing us to celebrate these festivities. Let's try in this small way to pay a bit of what we owe. Hopefully this will make people stop and think of our heroes, living and dead, who sacrificed themselves for us. In the 'Best Overall Blog' category, the race between first and second was extremely close with Powerline edging out little green footballs in a well-deserved victory! Congratulations also go to Kerry Spot which was the winner by quite a large margin in the 'Best New Blog' category over INDC Journal. Click on the logo to be taken to the full results. Wouldn't it be nice if this site were nominated in the 'Best New Blog' category next year? I can only hope there is someone reading this who gets at least a small amount of enjoyment from it. 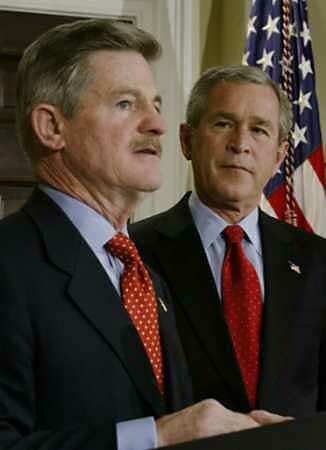 President George Bush muses to himself, "I wonder how I would look with a mustache?" It doesn't really get any worse than this pathetic, almost unintelligible (and really bad) attempt at humor entitled 12 Days Of Rummying by Maureen Dowd in the New York Times. Note to Maureen: There are places you can go to get help voluntarily. At the end of this week, he will move out of his elegant chandeliered suite on the second floor of the Capitol, leaving behind the trappings of power - his fabulous view of the Washington monument, his phalanx of aides, the Gilbert Stuart portrait of George Washington on his office wall - for a new, and as yet undefined life in the private sector. Don't cry for Tom Daschle South Dakota. CBS News Reporting - Bloggergate? Internet blogs are providing a new and unregulated medium for politically motivated attacks. As compared, of course, to the ‘regulated’ political attack by CBS’ Dan Rather in which he presented, without adequate fact-checking or corroboration, forged documents questioning President Bush’s National Guard service? Even though the documents were proven forgeries, Rather, while in the middle of his apology for presenting forgeries as ‘the gospel by Dan’, continued to certify, without a shred of evidence, that the underlying message in the forgeries was correct. Both blogs favored Thune, but neither gave any disclaimer during the election that the authors were on the payroll of the Republican candidate. No laws have apparently been broken. Case precedent on political speech as it pertains to blogs does not exist. But where journalists' careers may be broken on ethics violations, bloggers are writing in the Wild West of cyberspace. There remains no code of ethics, or even an employer, to enforce any standard. Does case precedent exist as it pertains to filmmaking? If Mr. Kuhn saw Fahrenheit 9/11, he should be able to write of his great concern about the code of ethics displayed in that gem. Perhaps he is waiting for the Academy Award nominations to be announced before he expresses his outrage. At minimum, the role of blogs in the Daschle-Thune race is a telling harbinger for 2006 and 2008. Some blogs could become new vehicles for the old political dirty tricks. Mr. Kuhn, being ‘employed’ by CBS News, must certainly understand the difference between ‘news’ and ‘punditry’. ‘News’ as presented by CBS should generally be ‘the facts and nothing but the facts’, with the audience left to decipher the message and make up it’s own mind. ‘Punditry’, the ‘op-ed’ page of television and the internet, generally displays the author’s bias right up front with little left to the imagination. Dan Rather, esteemed anchor of the CBS Evening News seems to have missed that course in journalism school. Consultants are usually hired to give their opinions, advice, and talking points to, not take them from, a candidate. Jon Lauck and Jason Van Beek, who just happened to have weblogs where they were free to ‘pundit’ away, were paid political consultants and the Thune campaign correctly reported said payments to the Federal Election Commission. No laws were broken and nothing was hidden. Mr. Kuhn must also realize that there is a difference between being employed by someone and accepting a contribution from someone. CBS News, by employing Mr. Kuhn, generally has a right to tell him what to write and after he has written it, has a right to change it, air or publish it, or throw it in the trash. The choice belongs completely to the CBS News. They own his work product and the right to do with it as they see fit. A contribution may encourage a particular message begin or continue, but the contribution doesn't guarantee said message. Did Senator-elect Thune (has a nice ring to it, doesn’t it?) and/or any entity of the Republican Party own the weblog Daschle v. Thune or South Dakota Politics? If they did, said ownership would have had to be reported to the Federal Election Commission, and I’m sure CBS would have reported it to us. As an interesting aside, on November 30, 2004, Joh Lauck discontinued his blog and joined Jason Van Beek at South Dakota Politics. Yesterday Congress passed the spending bill that keeps the U.S. government going through the end of the year. Not only does it keep our government going, but it also keeps the Palestinian pseudo-government going by sending them a mere $20,000,000.00. This begs the question - What the hell were they thinking? Why are we continuing to throw money at these ungrateful terrorists? Of course, the $20,000,000.00 was supposedly earmarked for utility bills. However, past monies have either been stolen by the likes of Arafat or used to buy millions of dollars worth of munitions, but certainly haven't been going to the direct aid of the Palestianians who, despite millions of dollars of direct aid from the U.S. government, live in abject poverty (everyone but Mrs. Arafat that is). The Palestinians should not be given one more dime until they agree to the peace proposal President Clinton negotiated in 2000, and outlaw the terrorist organizations within their borders. Remember to vote for your favorite bloggers! F. James Sensenbrenner Jr. (R-Wis.), the House Judiciary chairman, was absolutely right to put up a stink about driver's licenses being given to illegal 'immigrunts'. While some reform is needed in the handling and sharing of intelligence by the many government agencies that collect, analyze, and use it, the driver's license is indispensable to someone who wants to move about this country. The nineteen 9/11 hijackers had 63 licenses between them. I don't understand why the families of the 9/11 victims pushing so hard for this bill don't demand driver's license reform as well. Let's hope that the bill, if it passes without addressing this problem, does more than just create another giant bureaucratic mess. Secretary of State Kenneth Blackwell, Ohio's chief election official, made Bush's victory there official by certifying the results of the November 2nd election. The final margin of victory was 118,775 votes. An article by Andrew Welsh-Huggins in the Washington Post indicates that the battle is not over for some of the losers. A ruling by a federal judge in Columbus on Friday rejected one county's attempt to stop a recount, avoiding a legal precedent that could have stopped other recounts. Green and Libertarian party candidates have already raised the required $113,600 for a recount. The Democratic Party also said Monday it will examine reports of voting problems in Ohio. Outgoing Democratic National Committee Chairman Terry McAuliffe said the party will spend "whatever it takes" to study complaints from Ohio voters. Obviously, it would take a true miracle to find enough votes to change the outcome. Neither of the two parties asking for a recount really has a dog in the fight, so why are they footing the $113,600 bill for a recount? If they were hoping that Kerry would ultimately win, why did they run a candidate in the first place? They had to realize that by running a candidate they would ultimately hurt Kerry far worse that Bush. Terry McAuliffe can pay to study complaints about the election all he wants. Republicans stood in the same lines as the Democrats, but I did not hear about any Democratic headquarters being ransacked by Republican thugs or Democratic vehicles being trashed the night before the election. McAuliffe should consider spending some of that extra money on a study that will help the Democrats pick better candidates in the future. Just Exactly Who Is Running The Asylum? In 1985, the owners unilaterally terminated a joint drug program with the players, as was their right. They terminated the program because it was not working for them. The only way a player was going to be tested under the program was if his team submitted his name to the drug panel and said he was suspected of using recreational drugs. Teams, not surprisingly, were reluctant to turn in their own players. If players are to be hanged for any kind of drug use, the clubs want the players to hang themselves. The clubs do not want to be the hangmen. And although Commissioner Bud Selig has said this year that he wants a stringent steroids-testing program, he has ignored past drug problems. When the player strike in 1994 cancelled the World Series it become apparent that the players had no real concern for the sport. Milquetoast commissioner Bud Selig is clueless. The past drug testing agreements negotiated with the players' union might as well have been written by the Medellin drug cartel. The players could easily go on strike over a drug policy that has any teeth. With the NHL on strike over something as benign as money and the NBA about to collapse because the players are unable to control themselves, football may be the only major team sport left. Should anyone really care? Has former Clinton administration national security adviser Samuel R. "Sandy" Berger slipped under everyone's radar since we now have the oil-for-food program to investigate? He was supposedly under criminal investigation for removing copies of highly classified documents from the National Archives by stuffing them in his "briefs", but we haven't heard a peep about it for months. While Martha Stewart sits in the hoosegow for merely lying to the FBI about an incident that turned out to be not a crime, Mr. Berger is cavorting about after apparently admitting he surreptitiously removed the highly classified documents and then 'inadvertently' threw them out. Sounds like something Secretary of Defense Donald Rumsfeld might say. The recent media hand-wringing over the coming elections in Iraq is really pathetic. They couldn’t wait for us to turn over control of Iraq to some Iraqi, but now that we have and the process of forging a new government has begun, the MSM (main-stream media) is simply beside itself. The elections should take place regardless of any no-go zones and the threat of violence. Iraq will not be a completely safe place for a quite a while considering the huge caches of weapons we are still uncovering. Freedom didn’t come easy for America, and it isn’t coming easy for Iraq. This is, however, an opportunity for the Iraqi people to begin to erase the past and help themselves down the road to a free country, with free elections. Have they forgotten the elections of the past when Saddam Hussein received 101% of the votes? One would hope that the Iraqis have a burning desire to live in peace and prosperity; to vote in free elections; and to finally control their own destiny. Freedom is theirs for the taking, if they would only grab it and hold on for dear life as we did. We are there to do the dirty work for them. A little help uncovering the insurgents’ strongholds and the caches of arms would go a long way in making the elections safer. If the good people of Iraq would only say enough is enough to the killing, the no-go zones could be cleaned up in 60 days - just in time for the elections. Would-be statesmen among the Iraqis still fighting against change should understand that the January 2005 elections are the greatest gift anyone could give them. These elections are to decide who is going to write their “Declaration of Independence” from tyranny; and their “Constitution,” the road map for future peace and prosperity. To be a part of this election process is the best hope for all Iraquis regardless of their ethnicity. When Muqtada al-Sadr agreed to disarm his militia and join the political debate, I was hopeful. (The glass wasn’t half full, but had a drop of water in it anyway... we are dealing with Muqtada al-Sadr after all.) Perhaps al-Sadr is a statesman in the making. He is young and influential. If he will keep his word and stop killing ‘infidels’, and perhaps even get his followers to help clean up the problem, he could be a major player in Iraqi politics for many years. If he can’t keep his word, the American forces will deal with him. I’m afraid a twisted religious fervor has made it impossible for many Muslims in Iraq, and around the world, to do the right thing. Life means little to them. They have no hopes or dreams for themselves or their children. Their homeland means nothing to them. It is not possible for them to behave in a civilized manner. They would rather dance in the street every time a vehicle is blown up, or hang an infidel from a bridge after mutilating the body. Joy is found in ridding the world of non-believers and nothing else. There will be no-go zones in Iraq beyond the January 2005 elections. Eventually, however, the Muslim zealots must, and will be destroyed. There will be no peace until they are gone, but there will be peace, even if it comes from the working end of an M-16. Let’s hope they can handle the 72 virgins waiting for them when Allah greets them at the gates of hell. Tom Ridge is leaving his job as Director of Homeland Security. It was a big thankless job. The question remains: Are we safer now than we were before he took the job? We have a color-coded warning system that everyone is familiar with. It doesn't really do anything to make us safer, but it sounds good. I hope someone didn’t stay up all night figuring it out. Airline passengers are definitely safer in the cabin of the plane. Security for the passengers is so tight that they are doing everything but strip-searching the passengers before they get on the plane. Security checks on the airport workers have been proven to be abysmal. I don't think the airport workers would have a difficult time getting some explosives onto the tarmac and subsequently into the a plane's cargo hold at any number of airports via the delivery trucks or under the worker's clothes. The biggest problem persists - the borders. The INS has been worried about a few fake ID's at the border crossings while hundreds of thousands of ILLEGAL aliens are pouring across the Mexican border each year with NO ID's, NO skills and NO assets. (Let’s not forget about all those Canadians storming across our northern border, either). Congesting our communities' schools, emergency rooms, and jails, these illegal aliens cost hundreds of millions of dollars to already broken economies in California, Nevada, Arizona and other southwestern states. The administrations of Ronald Reagan, George Bush 41, and William Jefferson Clinton turned a blind eye to this problem in the 80’s and 90's. The George Bush 43 administration has had both eyes closed to this illegal attack on our society for the last four years. Truth be told, they need a white cane and a seeing-eye dog. Increased scrutiny at border crossings and claims of added technology to help control the flood of insurgents crossing our borders daily are merely pacifiers meant to keep the populous from crying aloud day and night. No matter that we are at war..no matter that terrorists want to come here and blow something up..no matter that the states' economies are bankrupt. No. Let's spend billions rebuilding Afghanistan; hundreds of billions to liberate Iraq; and spend more billions attempting to fix an unfixable AID's epidemic in Africa instead of securing our own borders. No more talk...we need action...real action, HERE in OUR HOMELAND. The new homeland security director needs some backbone and a lot of attitude. 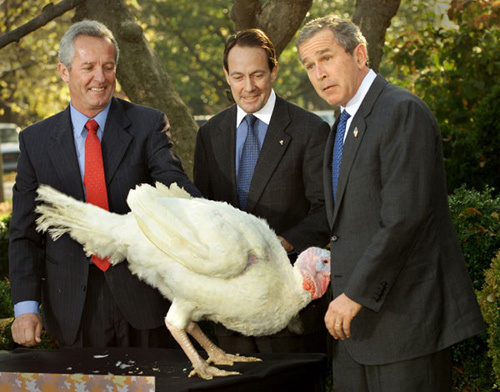 It's OK for Bush to appoint 'yes men' to his cabinet. I don't care if the Secretary of the 'whatever' has YES tattooed on his forehead. Let's hope Tom Ridge's replacement doesn't.